Noel Gallagher’s High Flying Birds are set to play Manchester Arena on Monday 9th March and we’ll be there collecting. If you’re heading to see Noel Gallagher, look out for our team and our shakers, we’ll be collecting money to put back into the local communities across Greater Manchester. 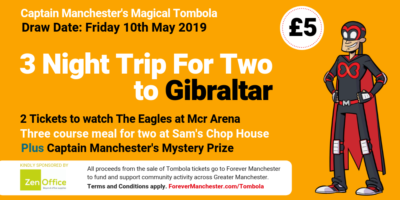 We’ve been given the opportunity to collect thanks to our relationship with Manchester Arena, who have chosen us as one of their charity partners to celebrate their 20th anniversary year. The Arena have given us the opportunity to collect at gigs of various talents from Manchester including Noel, Take That and Simply Red. It’s a great opportunity for us to raise awareness of our cause on the streets of Manchester, and if you’re around come and say hi! Each penny raised will be reinvested into communities across Greater Manchester where these artists grew up, worked and played their first gigs. Once again, we’d like to thank Manchester Arena for their ongoing support and for choosing us as a charity partner to celebrate their 20th birthday.